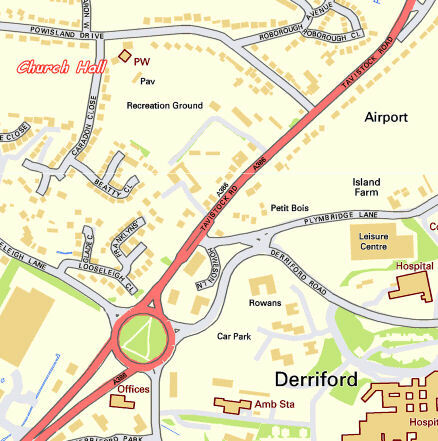 Our monthly Group Meetings are held in the spacious hall of the Derriford (United Reformed) Church Hall, Powisland Drive, Derriford, Plymouth, PL6 6AB, just off the A386 Tavistock Road. The meetings are held on the third Monday of every month. Any deviation to this, usually caused by Church commitments, will be shown in the Calendar and in our quarterly Newsletter. A reminder will also be given at the preceeding Group Meeting. The doors open at 7:00pm and the Chairman will begin the meeting between 7:30pm and 7:45pm depending on the amount of Group business due that evening, such as the presentation of certificates, new events schedule etc. The Guest Speaker will start their presentation at around 8:00pm and this will include 'question time' either during or after the presentation. The Guest Speaker will finish around 9:15pm. The meetings will conclude by 10:00pm. Occasionally a motoring talk will be given prior to the Guest Speaker presentation. These talks are usually announced at the preceeding Group Meeting. Only by attending regularly will you be aware of these additional talks not advertised in the Calendar or the Newsletter. Tea, coffee and biscuits will be available before the meeting.